The SPY S&P500 index has peaked at $293 this year and dropped down to around $263 twice, it looks like it will hit it a third time soon. I deployed around $44,000 at the midpoint of the high and low when the SPY was around $279 this week. The market has recently fallen further and I am collecting additional cash to deploy. I estimate by Christmas to New Years I can have around $7000 to invest. My goal is not timing the market but acquiring more shares to increase my income. Regardless if the market is low or high that $7000 will be put to work. My plan is to continuously deploy several thousands of dollars per month and over time the money will dollar cost average since sometimes I purchase at the lowest valuations and sometimes at the highest. My portfolio peaked at $612,000 and with recent volatility dropped to $595,000. Due to the increasing size of the portfolio, small single digit percentage swings in the market can make appreciable fluctuations in the portfolio's net worth. However, dividends have remained relatively unchanged comparing dividend output the portfolio is at now to compared to dividends when the portfolio was at its highs. Price fluctuations are totally random and unpredictable but dividend payout is more easily determined. One can read the annual report 10-K or quarterly 10-Q filings of a company to calculate if the cash flows or earnings are sufficient to pay the dividend, or calculate how much debt the company has to see how safe the balance sheet is. The focus of the portfolio is on the dividend payout, the growth of the dividend, and the safety of the dividend. 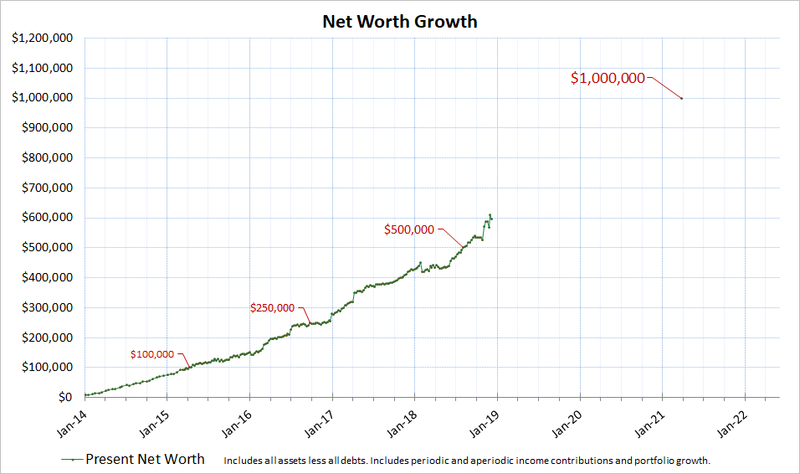 In terms of end of the year goals, it may be challenging to hit $600,000 by end of year depending on market volatility. I am not too focused on the absolute dollar amount goals. In terms of income growth, I am quite happy with how much dividend income my portfolio now generates after I increased my shares this week. The portfolio produces around $1360 in dividend income every month on average. I want this dividend number to surpass $20,000 per year in dividends sometime in 2019 which is around $1,670 a month in dividends. 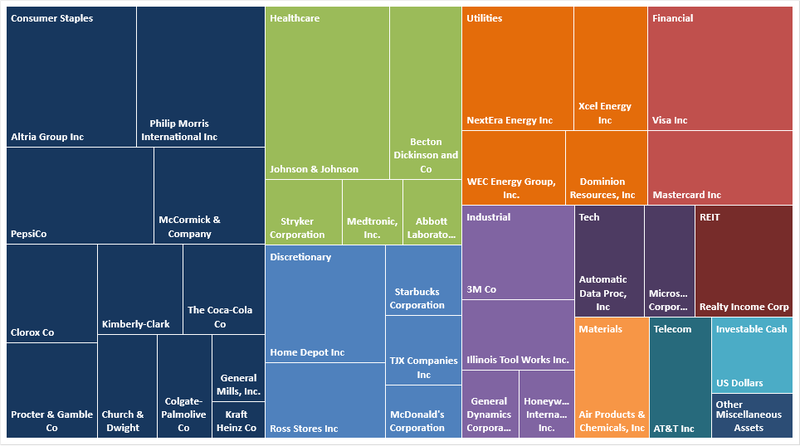 The portfolio is heavily concentrated into defensive names as they produce high income consistently. They also usually have a good track record as well, as I like to invest primarily in dividend aristocrats with 25 years plus of consecutive dividend increases. Since I am more weighted in defensive names, the recent declines in the broad indices have not hit my portfolio as hard. 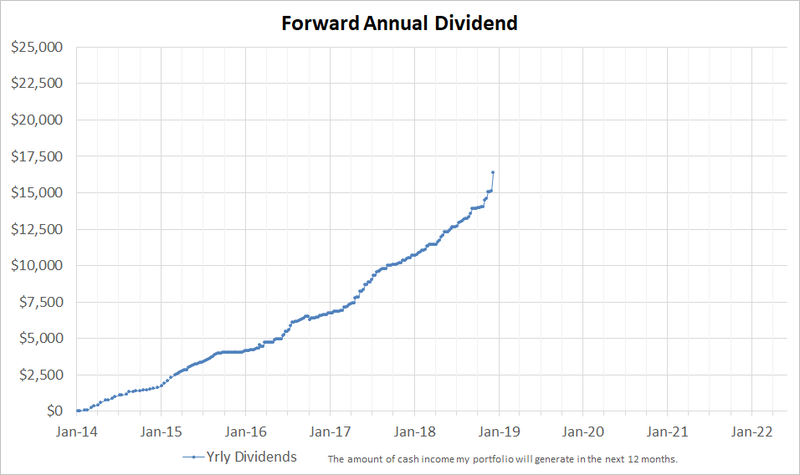 Your forward annual dividends chart is exploding. Investing $44k with the market trending down is incredible. Being greedy when others are fearful is just what our friend, Mr. Buffett, advocates! You're setting yourself up for a great finish to the year in December to springboard into 2019.